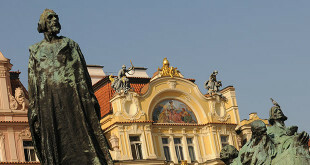 The monument of Jan Hus at Prague’s Old Town Square was designed by Ladislav Saloun. The foundation stone was laid in 1903 and the monument was unofficially revealed on 6 July 1915, the 500th anniversary of the reformer’s execution. The statue was paid for solely by public donations. 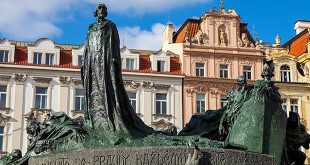 Born in 1370, Hus became an influential religious thinker, philosopher, and reformer in Prague. Hus believed that Catholic Mass should be given in the vernacular, or local language, rather than in Latin. This did not go down well with the Vatican in Rome and Hus was ultimately condemned by the Council of Constance and burned at the stake in 1415.